Throughout last week the pair traded upwards. After reaching the local highs of 1.3815, European currency fell for more than 100 points to the level of 1.3700. 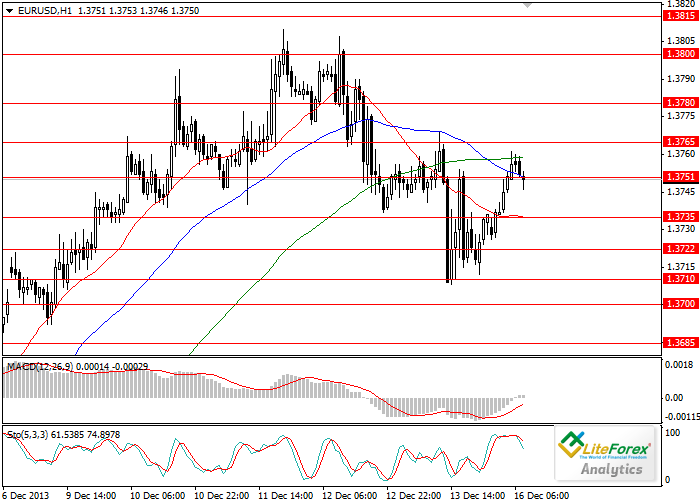 This week the pair EUR/USD started at the level of 1.3727 and at the moment the instrument is trading near the level of 1.3750. The main event of this week is the US Fed meeting, where new interest rates and the volume of assets purchase will be announced. The US macro-statistics was quite positive lately; therefore, chances that quantitative easing program will be reduced are high. We would remind that the forthcoming meeting will be the last for Ben Bernanke in the office of the Federal Reserve chairman. Technical indicators give ambiguous signals. The signal line of MACD is prepared to cross the zero line from bottom to top, giving a buy signal. Stochastic lines have crossed in the overbought zone; they are directed downward indicating decline. The nearest support levels are 1.3735, 1.3710 and 1.3700. Resistance levels are 1.3765, 1.3780, 1.3800 and 1.3815. It makes sense to open long positions above the level of 1.3765 with the target of 1.3815. Pending sell orders can be placed below the level of 1.3700.